We've reached the end of our summer road trip and it's time to announce the final winners. Yesterday's secret location was Charlottesville, Virginia and the first correct guess came from Team Husky! Way to go! We also took everyone else who commented on any of the summer road trip posts and drew two names for additional winners. The winners are Edda and Jack & Moo. Let's take a look at our final map. 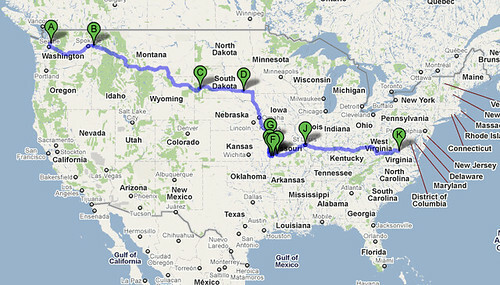 As you can see, we travelled all the way across the country in the 10 days of our summer road trip contest. We spent several days at our Missouri grandparents' house before continuing our journey to Virginia. You might be wondering why we decided to go to Virginia where it is almost 100 degrees. The answer is because our mom is going to start law school at the University of Virginia next week and we had to help her move! Of course, we have moved with her. So we are beginning our journey as law dogs. 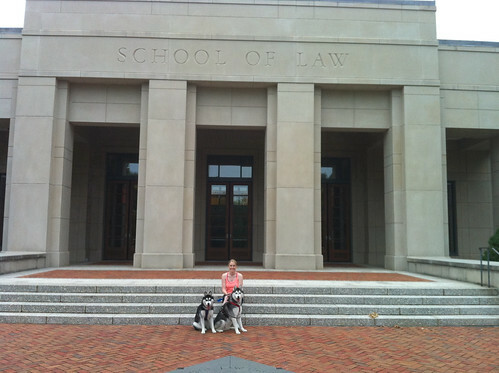 To go along with our new jobs as law school canines, we are also changing the name of our blog and moving to a real domain name. Please update your links so you can still follow along with us. We will now be over at Blawg & Disorder. See ya there!